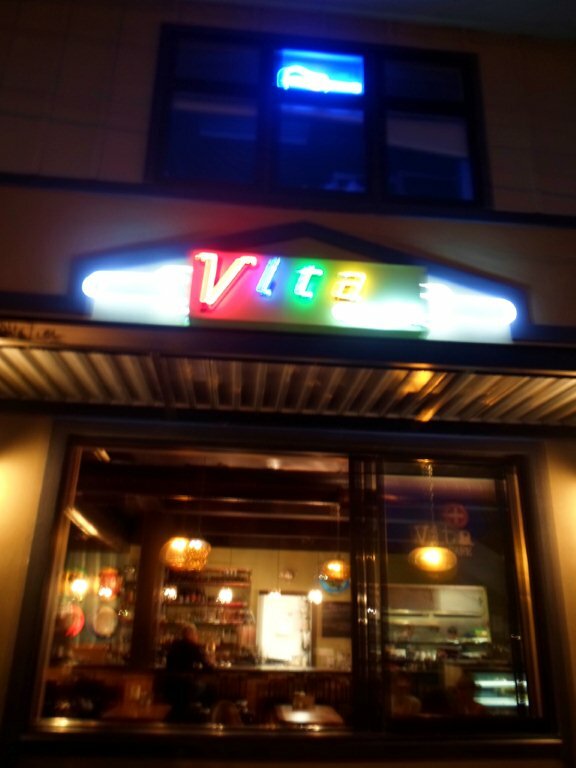 Vita Cafe in Portland’s Alberta Arts District. My first post-convention meal in Portland was a quarter of a mostly brown avocado and a peanut butter bagel I scrounged together from snacks I packed in my suitcase. Not exactly the kind of veg-friendly Portland grub I had been anticipating. After the International Food Blogger Conference this weekend, my mom and I (and baby foodie Jackson) met up with my sister-in-law and nephew to explore Portland. By a miracle of God, we squeezed three adults, a baby in a car seat, a toddler in a booster, four suitcases, two backpacks, one diaper bag, two totes filled to the top with swag from the conference, a stroller, and a bag of legos into a little Toyota Corolla. Starving, we headed to the new hotel to unload and get ready for an early dinner, but the hotel didn’t have our room ready. Not willing to drive much farther in these cramped quarters, we settled on having dinner at little diner down the street. The vegan options were sparce, even the veggie burger had dairy in it, so I ordered a side of avocado and went to my car to make a pb sandwich from the food I’d packed for our trip. At least Jackson didn’t mind eating a peanut butter sandwich, his new favorite lunch, for the fourth day in a row. He was much more interested in hanging out with his big cousin George than food anyway. My nephew George, always on the look out for super hero attire, turned Jackson’s bib into a cape. 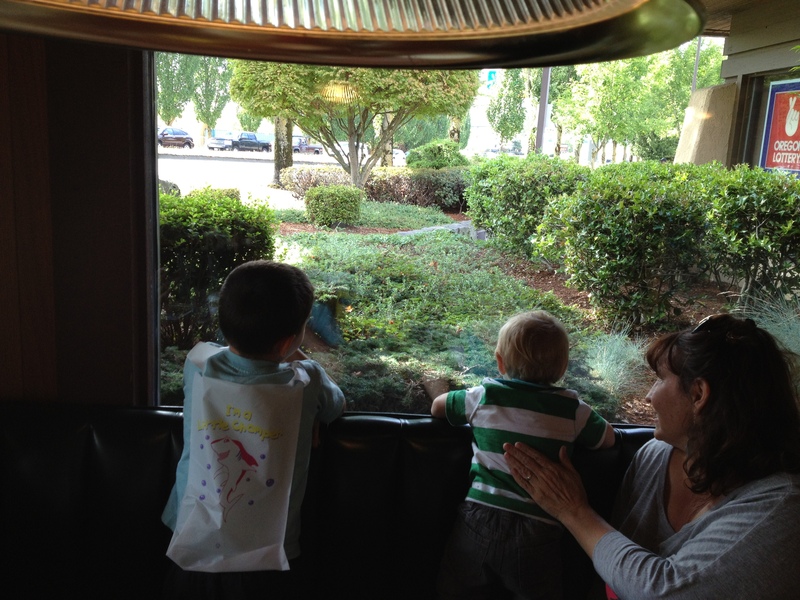 Jackson watching the birds with his Nonny and big cousin. I, on the other hand, was still hungry. I decided to hold out for the real deal. That night we headed to Alberta street, apparently the new up and coming vegan hot spot in Portland. We walked into a hip little restaurant with big windows open to the street and a dessert counter that had my stomach growling before we even saw the menu. The cool air gently breezed through the restaurant and for a moment I thought it was November. It’s been so long since this Texas girl has felt cool outside air. Aaaah. 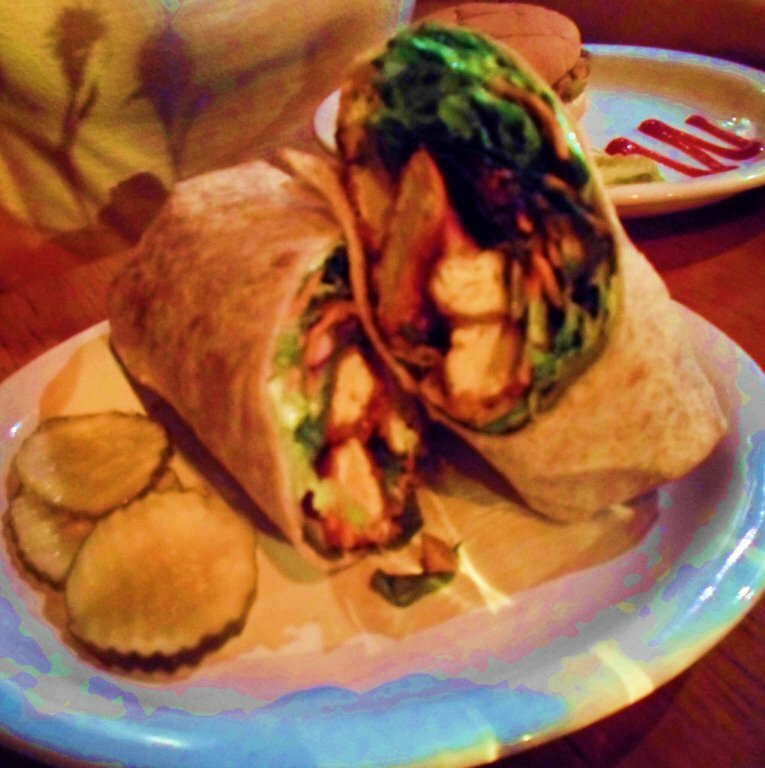 It must have been that feeling of crisp Fall air, but I looked at Vita Cafe’s menu with tons of vegan options and settled on beer and wings: an espresso stout (a coffee lovers dream beer) and a Buffalo Tofu Wrap. 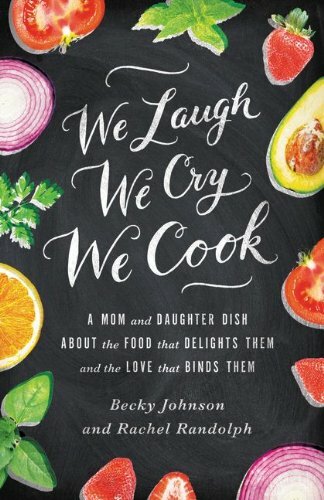 I actually made and blogged a very similar recipe back in 2010 on my old food blog, Life in Bites. This wrap took me right back to those early days learning how to cook a plant-based diet and finding my passion for being in the kitchen. The next day we came back to the same place for lunch and we ordered their Buffalo Things appetizer to share. Even someone with a tofu aversion would love these spicy fried bites. 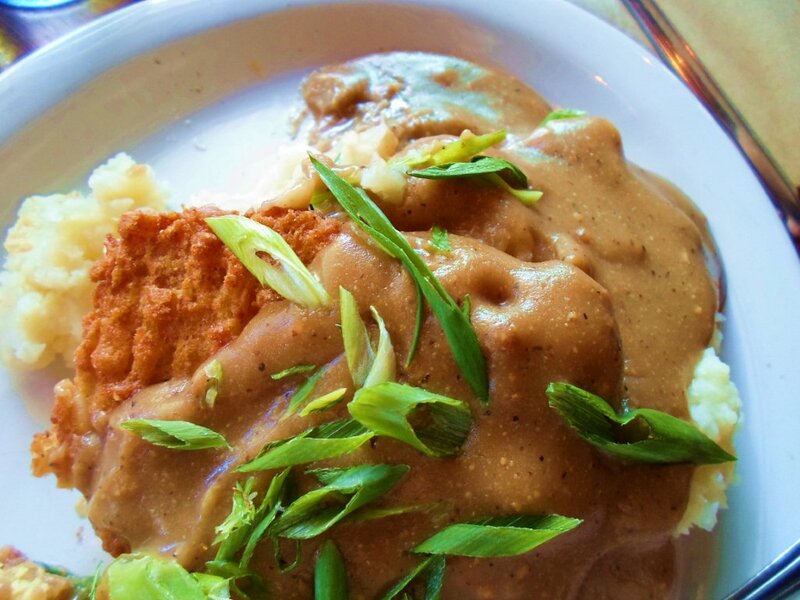 I continued with my fried food fest and had a Tempeh “Chicken” Fried Steak with mashed potatoes and almond gravy. The waiter told me they are known for that dish. I could see why. Amazing. Who knew I would find an old favorite southern comfort food in Portland, Oregon. “Chicken” Fried Steak with Almond Gravy. Very close to what I remember a good CFS tasting like. Dare I say better? Buffalo bites. 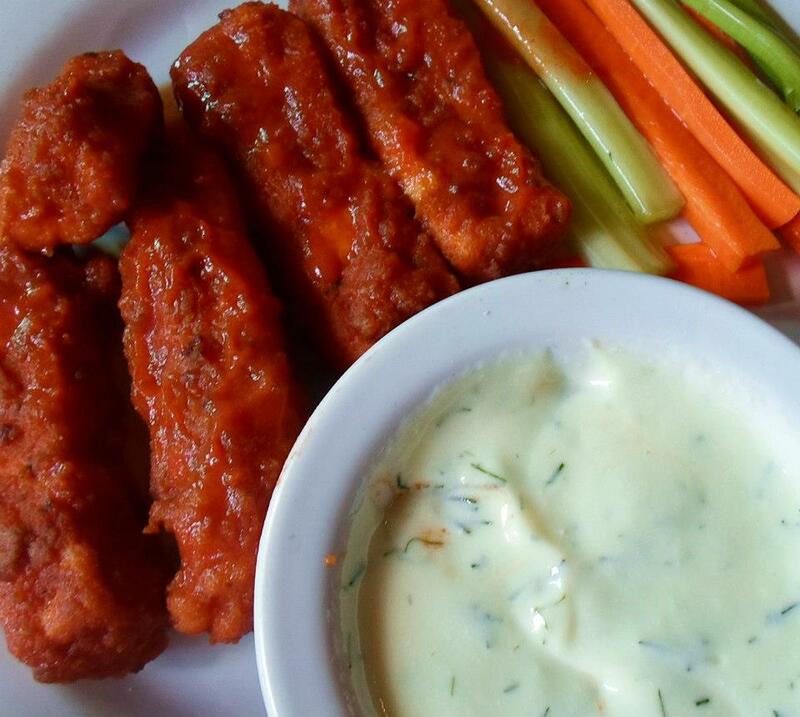 Ooops, looks like someone dove right into the ranch before we took a picture. 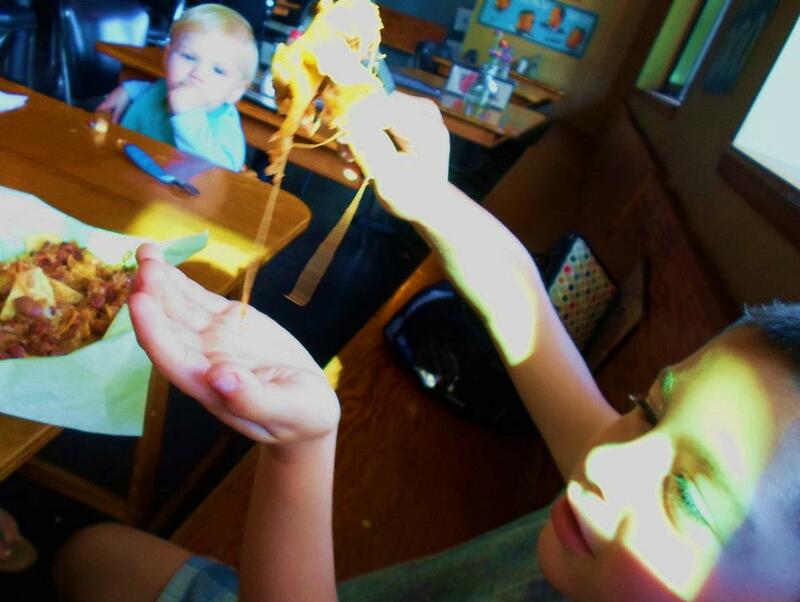 Capturing pictures while dining in a group with two kids is no easy task! Night time pictures didn’t turn out great. It was much prettier in person! 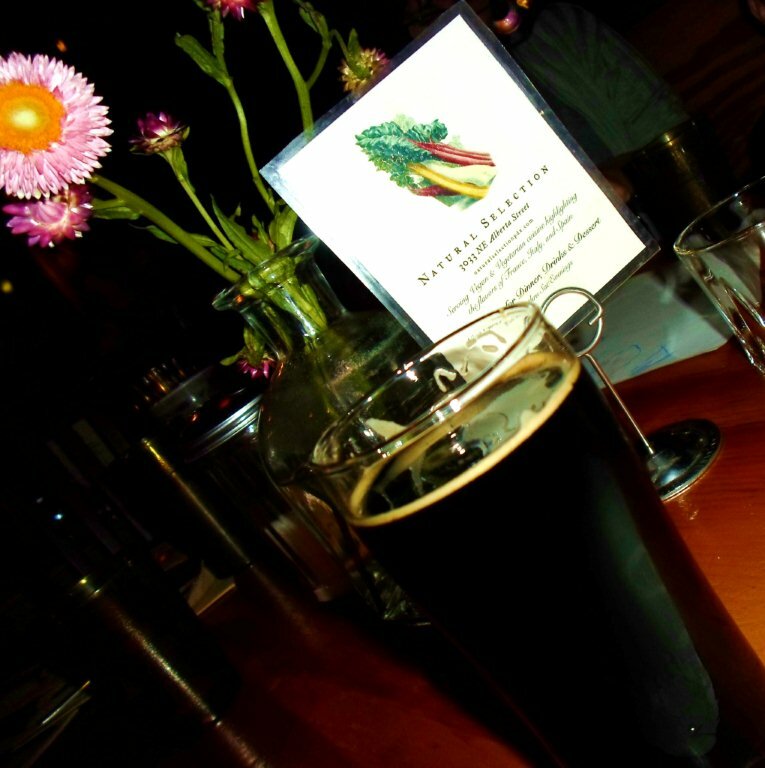 Smooth, rich and slightly sweet, this local (Eugene, OR) Espresso Stout by Oakshire Brewing was one of the best beers I’ve tasted. 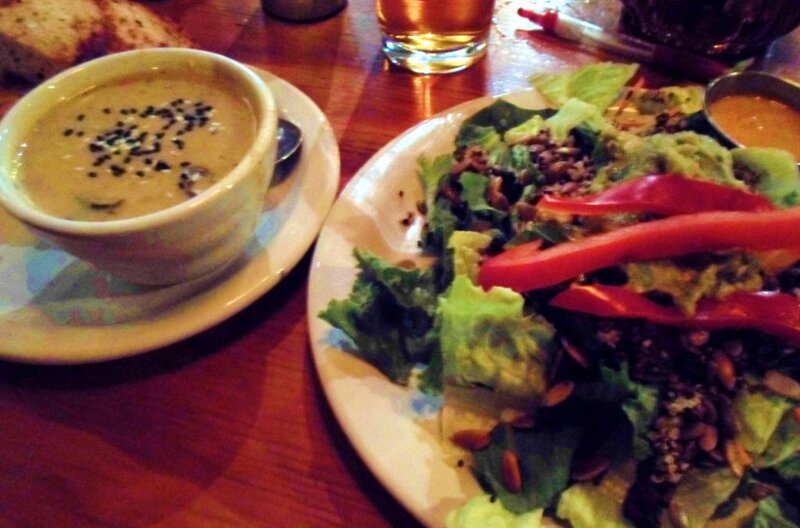 Julie had a beautiful Mediterranean appetizer plate and Jackson had a delicious house-made veggie burger. We ordered a piece of raw toffee cheesecake to go. I dropped the box on the side before I could get a picture of it, but it was one of the best desserts I’ve ever tasted. I would fly back to Portland just to have another slice. 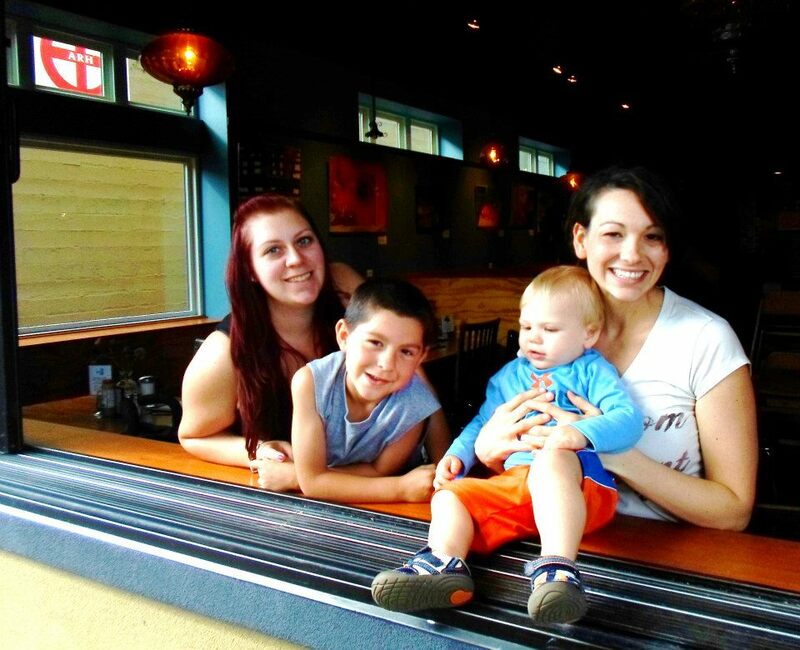 Not only was Vita Cafe a really cool place with plenty of vegan options, they also encourage you to bring kids along. They had toy boxes in the waiting area and kids eat for $1 between 5-7 every day. The kids menu included a veggie burger, vegan mac-n-cheese, nachos (vegan or regular), among other items and all in really generous portion sizes. I forgot Jackson’s sippy cup in the car and they even had a sippy cup for him. Nice touch. George was pretty thrilled with his cheesy vegetarian nachos. Hanging out the open airy windows at Vita Cafe. George, my nephew and mom’s grandson, lives in Seattle. 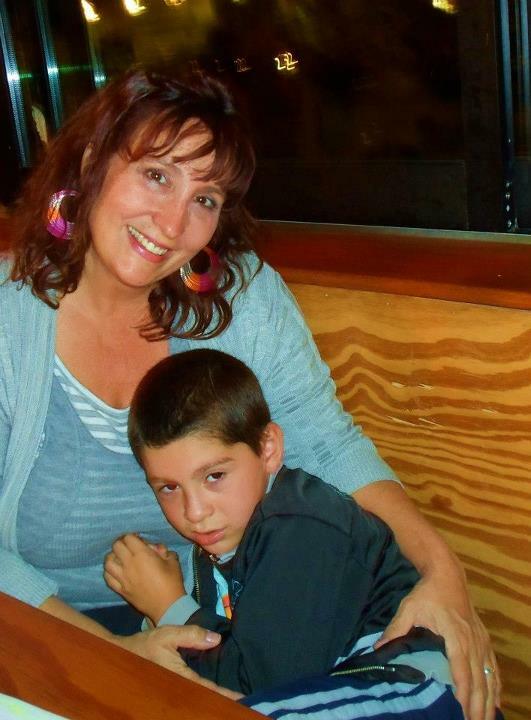 He loves his Nonny even more than cheesy nachos! 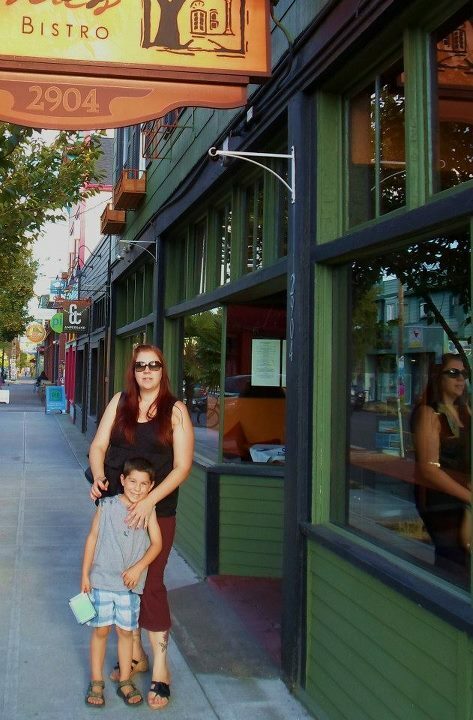 Within walking distance, there were several other cool spots, like Back to Eden Bakery and Dovetail Bakery, both award winning vegan bakeries, Salt & Straw ice cream parlor, several veg-friendly food trucks, Caffe Vita Coffee Roasting Co, and more. 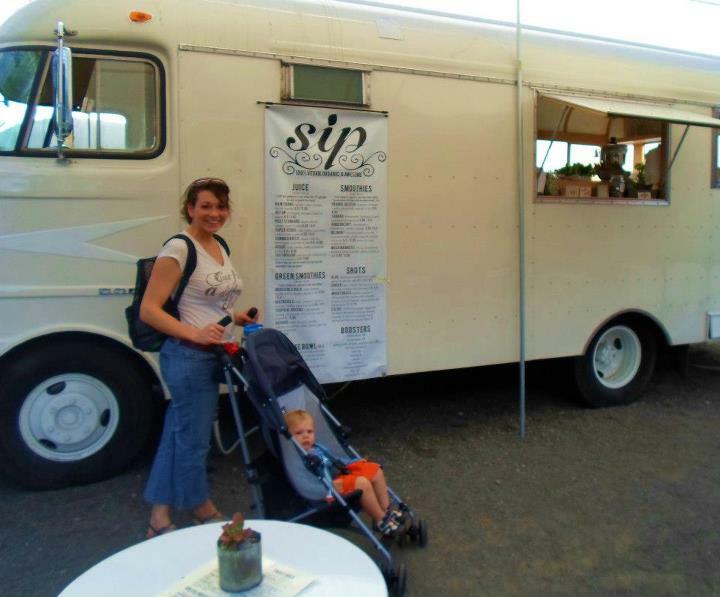 Sip – An all vegan drink truck on Alberta Street. 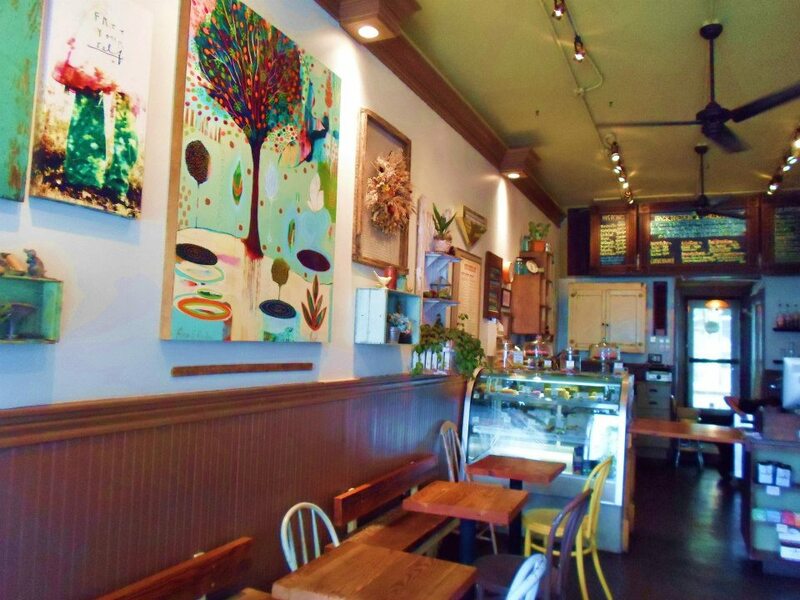 VegNews Magazine voted Back-to-Eden as 2012’s Vegan Bakery of the Year. While the others had ice cream from Salt & Straw, I had an amazing chocolate cream pie from Back to Eden. A funky little restaurant across the street from Vita Cafe. Julie and George on Alberta Street on a quiet Monday afternoon. Alas, my quest for a veg-friendly, kid-friendly, simply-friendly Portland foodie experience was conquered. If you’re in Portland, skip the chain diner and run straight to Alberta street.